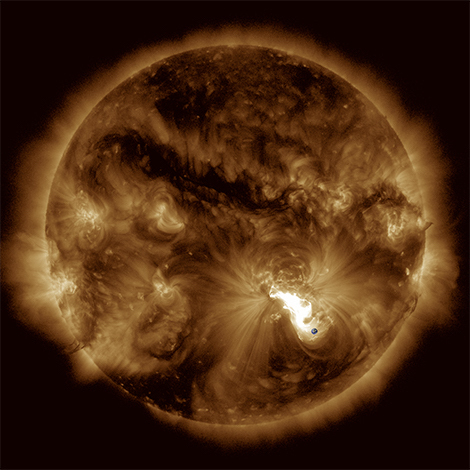 Major eruption of October 24,2014 observed by the AIA instrument of the NASA Solar Dynamics Observatory mission. Earth was added for scale. Just one phenomenon may underlie all solar eruptions, according to researchers from the CNRS, École Polytechnique, CEA and INRIA1 in an article featured on the cover of the February 8 issue of Nature magazine. 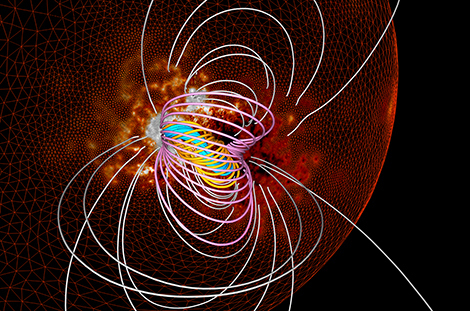 They have identified the presence of a confining 'cage' in which a magnetic rope2 forms, causing solar eruptions. It is the resistance of this cage to the attack of the rope that determines the power and type of the upcoming flare. This work has enabled the scientists to develop a model capable of predicting the maximum energy that can be released during a solar flare, which could have potentially devastating consequences for the Earth. 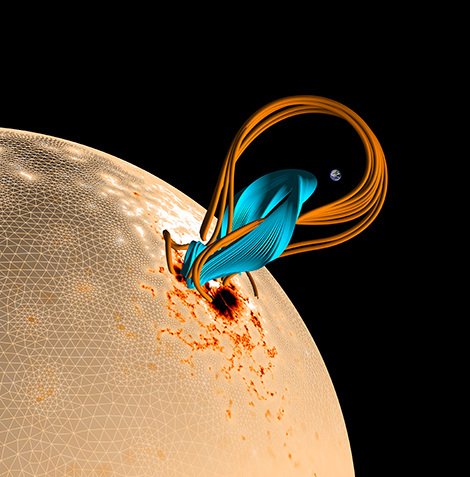 In 2014, researchers3 showed that a characteristic structure, an entanglement of magnetic force lines twisted together like a hemp rope, gradually appears in the days preceding a solar flare. However, until recently then they had only observed this rope in eruptions that ejected bubbles of plasma. In this new study, the researchers studied other types of flare, the models of which are still being debated, by undertaking a more thorough analysis of the solar corona, a region where the Sun's atmosphere is so thin and hot that it is difficult to measure the solar magnetic field there. They did this by measuring stronger magnetic field at the surface of the Sun, and then using these data to reconstruct what was happening in the solar corona4.